We are running a 30 target UKAHFT course open comp on Saturday 18th October at Mile Oak Shooting Club (The Oaks). We plan to start at 12:30 allowing any folk travelling down to the UKAHFT at Buxted sufficient travelling time. There will be a burger van present as well as a plinking range open all day with a covered firing point! Cost will be £2 for members and £6 for guests. Please drive at walking pace through the farm. 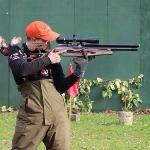 Note this will be a charity shoot - we will be raising money for the Martlets Hospice in Hove. I plan to set the course in the wood on Friday afternoon - if anyone can assist (or do some of it any other time in the week) that will be great. We will set the field on Saturday morning - 8am start so again any help much appreciated! We're also thinking of running a side shoot, at a time as not to interfere with the main shoot, this will consist of an IRON PLATE COMP, competitors will pay £1 a go, 1 mag practice and 1mag on the clock, competitors can have as many goes as they want and the fastest time overall wins a prize, wotcha fink? Hi Charles what sort of time are you thinking for Friday?